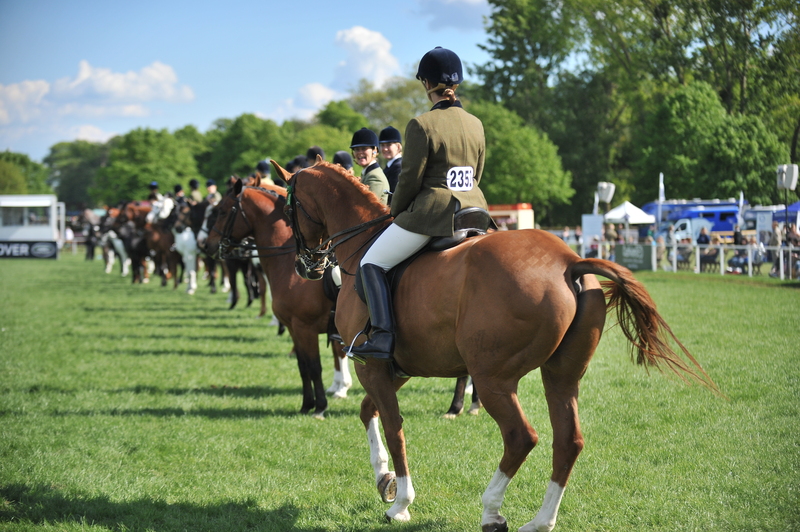 Royal Windsor Horse Show – 3 fun days out. 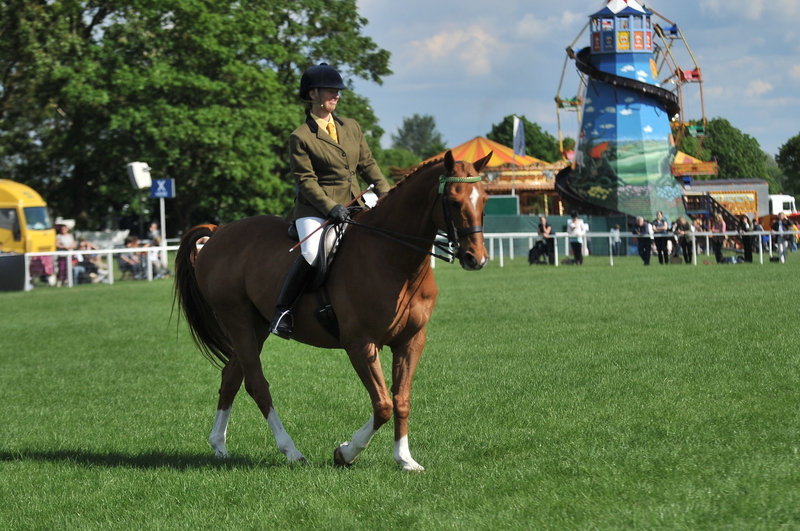 As a brief interlude from real work (both riding and writing), 3 days at Royal Windsor Horse Show in the glorious sunshine proved a treat, so I thought I’d share a random post about my days competing and stewarding there this week. 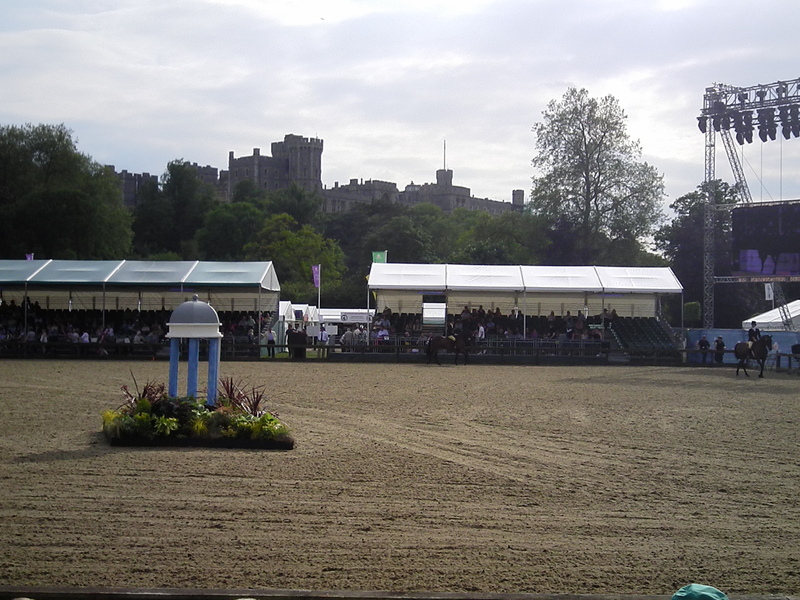 Last year, the BBC produced a program entitled The Queen at Windsor Horse Show. Now, of course, this show takes place in the Queen’s back garden, so to speak, and she can often be seen wandering around, taking a look at her visitors. 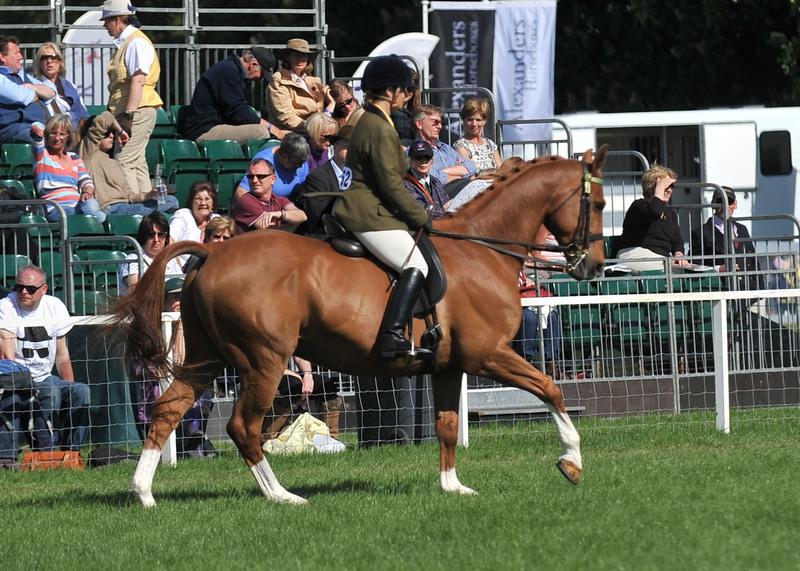 Watching the TV show, we saw her visit one of the outside arenas to look at the Senior Horse Class, in which she had a horse competing, and this proved the inspiration for me to have a go! 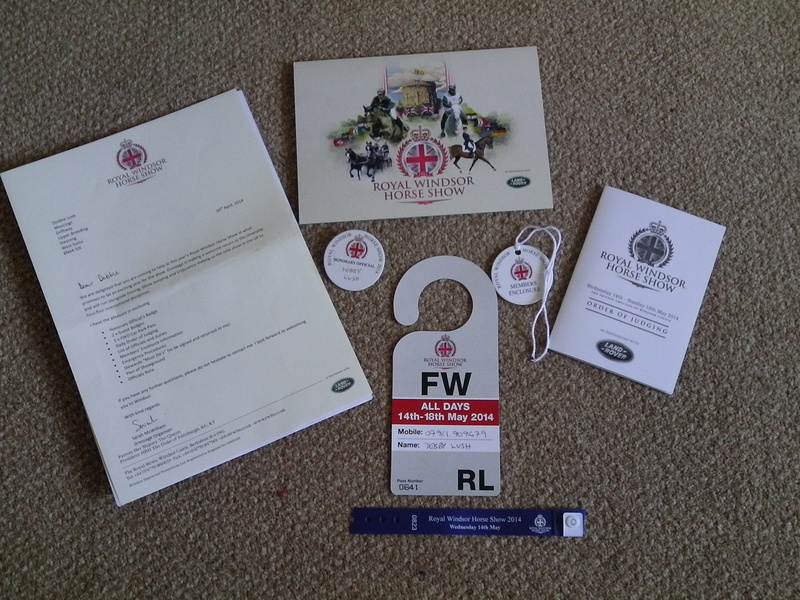 My oldest lad is 20 this year, plenty old enough for the Senior class (19 – 23 years old), so plans were made, schedules ordered and entries sent. 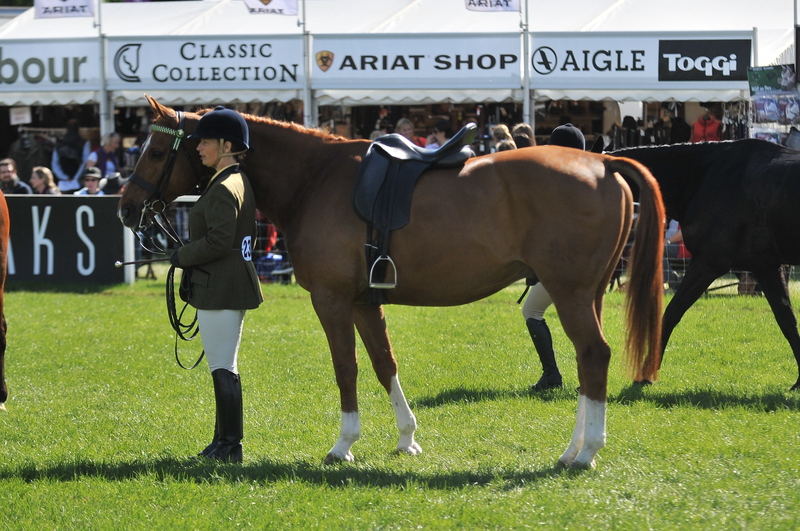 The class is (in theory) judged on suppleness and condition, and as he is still competing in Grand Prix dressage classes, he should be way the best in both departments. Sadly I had forgotten that his least favorite thing is standing still, and as the class involves standing in line while each competitor does their individual show – and there were 30 horses forward this year – we put on a disgraceful display of refusing point blank to stand for more than 30 seconds at a time (if we were lucky!) 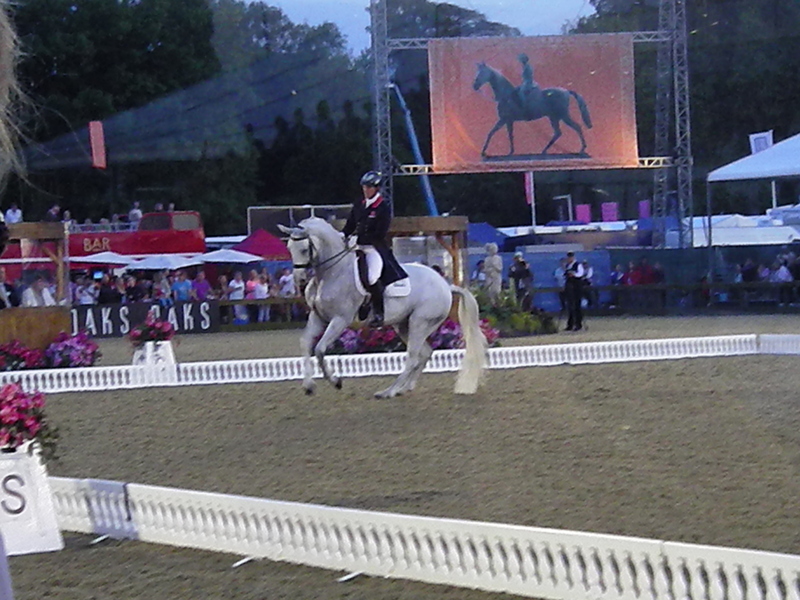 opting instead, to show off that most advanced dressage movement, piaffe, which involves trotting on the spot. It was a shame the Queen didn’t show up this year for our unscheduled display, but never mind, the other competitors found it all terribly amusing! So next day was on to official business. 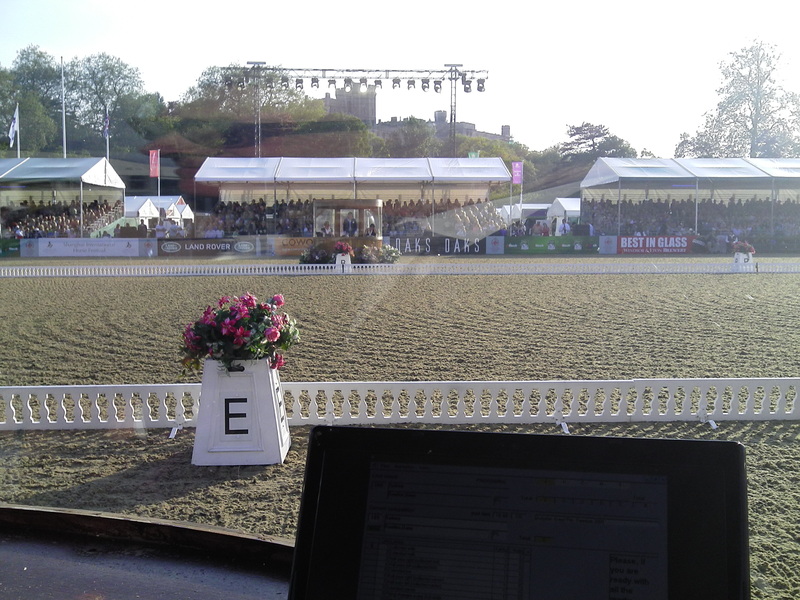 I have been lucky enough to become one of a very select number of people experienced in operating the scoring system at International dressage events (I’ve done 2 Europeans – Hickstead 2003 and Windsor 2009, the 2012 Olympics in London, and am scheduled to do the World Games in 2015), so when they decided to hold a small International at Windsor, I jumped at the chance to work in that lovely setting again. 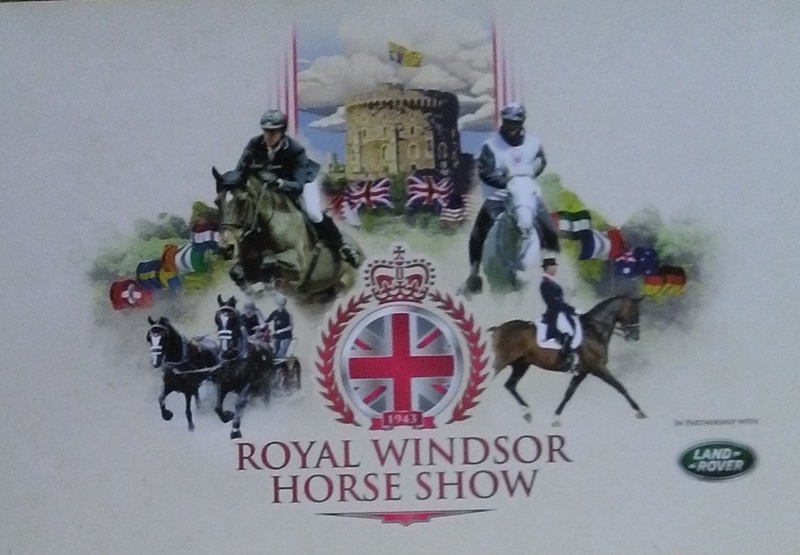 Aside from the dressage, there is carriage driving (Prince Philip’s passion), endurance riding, show jumping, many showing classes and lots of displays, not least from the Household Cavalry. And then, of course, there is also the shopping! 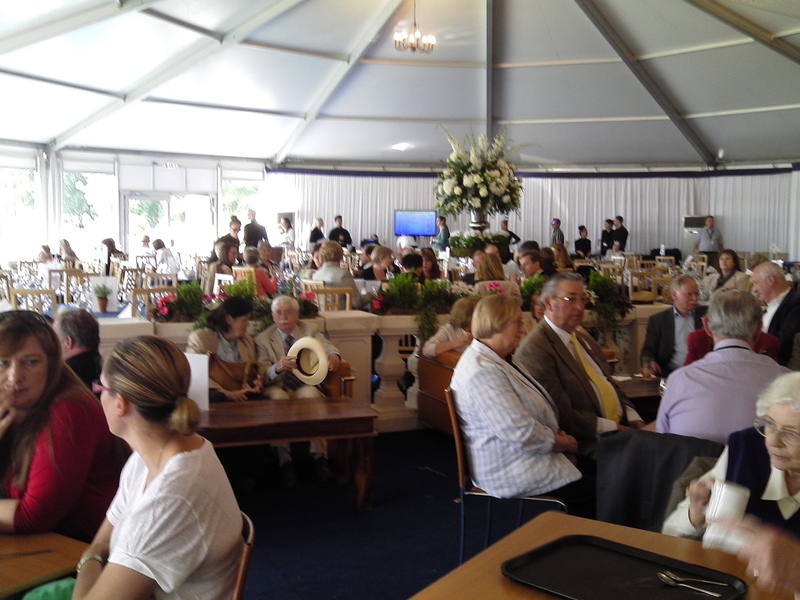 And enjoying the Member’s Enclosure for a delicious (but pricey) meal before commencing work. By happy coincidence, I was assigned to work with Danish judge, Lief Tornblad, with whom I had worked at the Olympics, so no settling in issues there. However, as the competition got underway, it fast became clear there was one almighty problem with the wifi, requiring frequent visits into the boxes by tech support, even while poor Lief was continuing to judge. 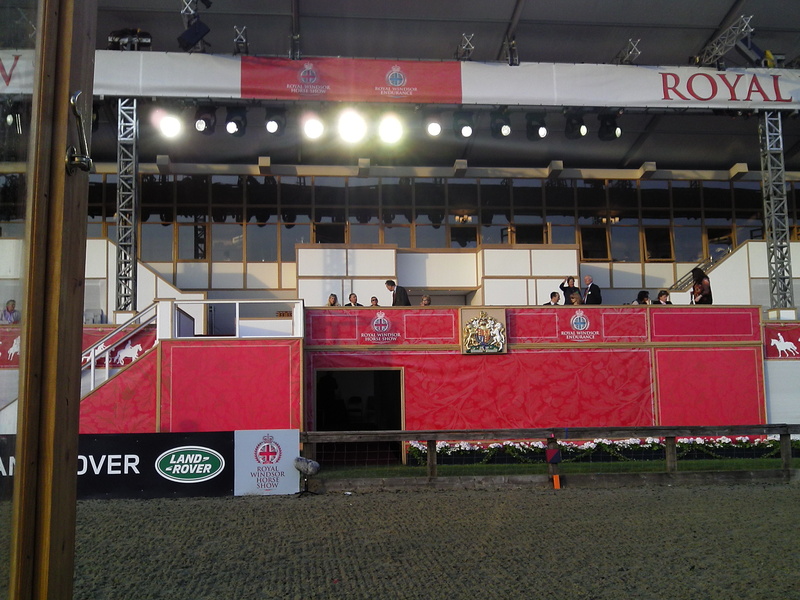 We were, however, treated in the interval to coffee in the Royal Box (no sign of any UK royals, though we did have to battle with some Bahrain dignitaries for access to the drinks). 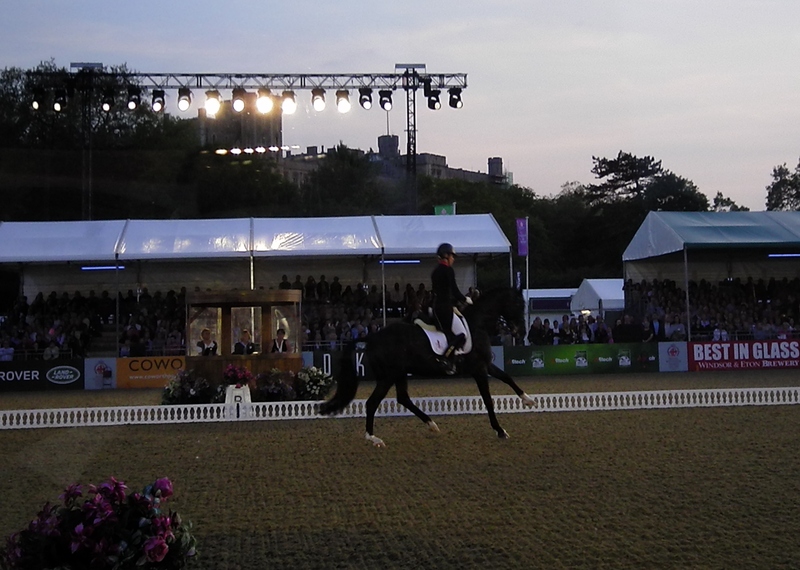 Olympic Champion Charlotte Dujardin, today riding Uthopia, who was 4th at the Olympics with Carl Hester riding. 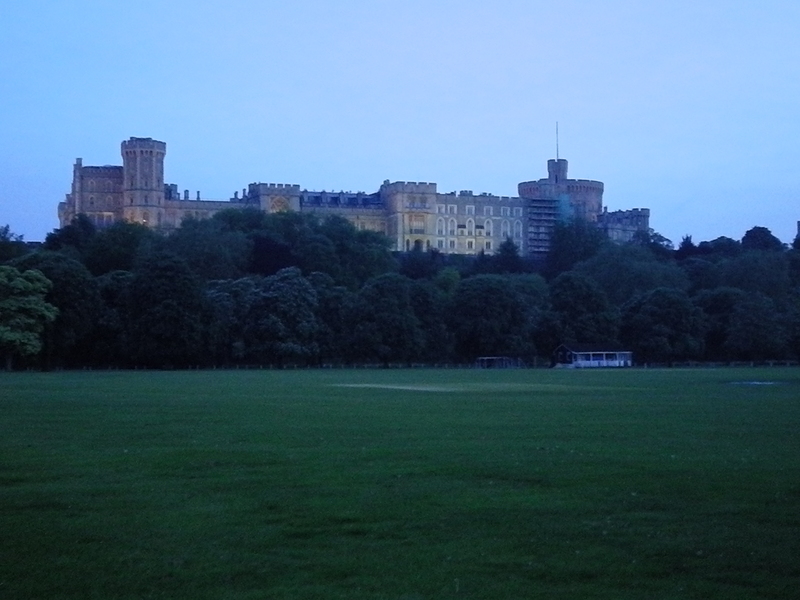 And so the show drew to a close, with a stunning walk back to the car park past the front of Windsor Castle itself. How about you guys – any great moments in the summer sun last week? You definitely had a great time! Last week was not summer-like here and – compared to your event – rather boring. Thanks, and yes, he is – and he likes everyone to pay homage! Hope your weather picks up, it’s still sun, sun, sun here for the moment.